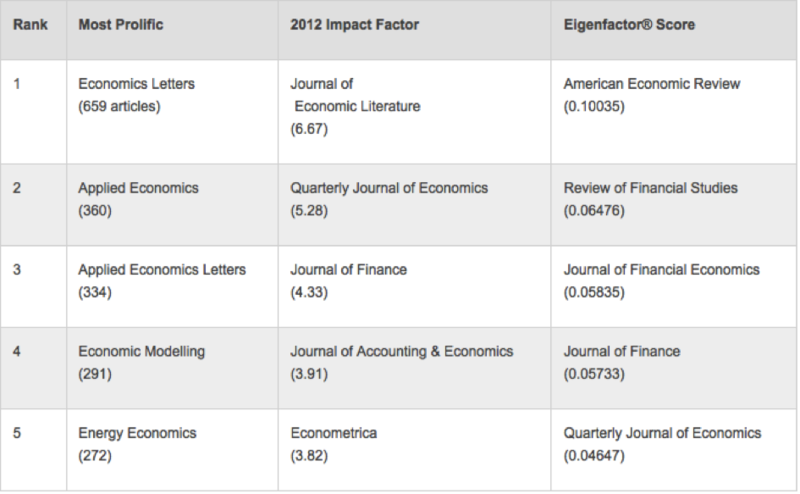 Thomson Reuters, in their blog Science Watch, offers a visualisation of the impact factors of journals in economics , as a result of a request made on the database JCR (Journal Citation Reports) to which the library subscribes. The result allows us to compare the most active journals in terms of the number of publications and citations, as calculated by JCR Impact Factor and the Eigenfactor Score. This request can be replicated on the JCR database for other disciplines or to compare specific titles between them. The library is at your disposal to help you make these requests.